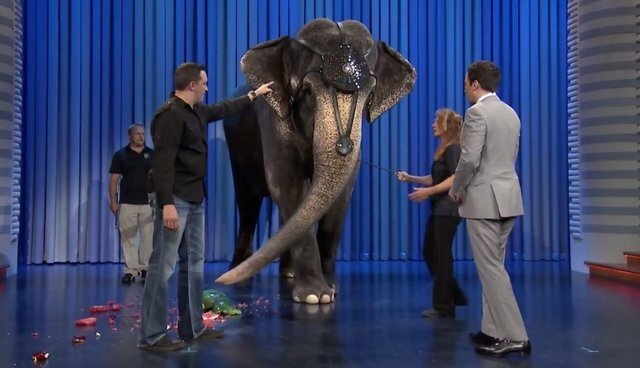 Last night, the Tonight Show featured a beautiful Asian elephant named Roxy who was paraded on stage with two handlers in tow to interact with host Jimmy Fallon for what was supposed to be a lighthearted bit. And sure enough, the crowd guffawed as she stomped on some fruit before being directed to lift Fallon up with her trunk. It might have been a real laugh-fest, that is, if it weren't really so deeply sad. "People don't understand, they're disappearing so fast in the wild that conservation is a big thing with these guys." And he's right. Every year, hundreds of elephants are abducted from the forests of Asia to be sold into captivity for human use as beasts of burden or as props for entertainment. But what he failed to mention was that Roxy herself was one of them taken from her natural habitat for that latter purpose. According to the captive elephant database Elephant.se, Roxy was born in the wild in 1965 and sent to be a performer for the Tarzan Zerbini Circus -- an operator that's infamous for its poor treatment of animals. In fact, in 1999, the USDA issued the circus a citation for failing to provide veterinary care to Roxy who was suffering from a swollen front foot. Roxy, retired from regular circus duties, is now held captive at the Two Tails Ranch in Florida. But despite the name, it's hardly an animal sanctuary. The facility, operated by the circus founder's daughter, Patricia Zerbini, still rents out elephants for events and makes them perform under the label of ‘educational programs' -- perhaps a bit like the highly informative bit that aired on the Tonight Show. While it might be nice to imagine that Roxy was a willing participant, a closer look reveals that that, of course, is not the case. The two keepers accompanying her are both holding an instrument known as a bullhook, a rod topped with a pointed, metal head which is used to poke and prod the animals' sensitive skin during training until they break and begin to submit to commands. Eventually, just the sight of bullhooks is terrifying enough to coerce elephants, like Roxy here, into performing bizarre and unnatural tasks. There's a decent chance that funnyman Jimmy Fallon wasn't aware of Roxy's sad past, the duress she was under, or that the segment on his show was perpetuating a bitter future for her and others like her, but it's important that it be made clear: many animals paraded for entertainment, especially highly-intelligent ones like elephants and primates, have similar life stories. As the host of one of the most popular shows on television, Fallon is in a position to set a powerful precedent by vowing to no longer feature animals on his show. If you agree, join our online petition, or tweet with the hashtag #FallonDropAnimalProps. Every year, hundreds of elephants are abducted from the forests of Asia to be sold into captivity as beasts of burden or as props for entertainment. It's up to public figures like Jimmy Fallon to lead by example, and boycott the use of live animals for television entertainment.